Story and Photos by Bradley MauleWilliam Allen wielded a lot of influence in colonial Pennsylvania—he was a merchant who built upon his father’s fortune, he helped finance the construction of Independence Hall, and he was a one-term Philadelphia mayor and a longtime chief justice of the Province of Pennsylvania. Mount Airy, his nine-acre estate, gave the neighborhood its name and is fronted on Germantown Avenue where the Lutheran Theological Seminary now stands. Despite Allen's prominence, his legacy isn't honored uniformly. 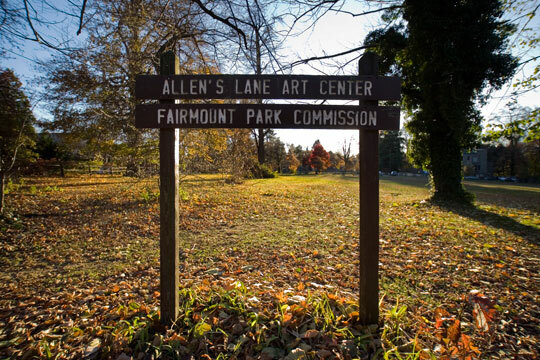 According to the city’s street signs, the street running perpendicular from the site toward Wissahickon Creek is Allens Lane. But maps as early as 1808 label it as Allen’s Lane. And SEPTA’s Chestnut Hill West signage? That’s Allen Lane, dating back to the Pennsylvania Railroad’s branch that opened in 1884. Local lore suggests the railroad’s sign painter misspelled it, but perhaps he was influenced by the railroad’s printing firm: Allen, Lane & Scott. Whatever the explanation, no plan exists to anoint an official appellation—the only consensus is that there is no consensus. For more on this story, visit the Hidden City Daily, hiddencityphila.org.